HUMBLE acronym, Humanize-Unlearn-Model-Build-Learn-Experiment, was born when Michael Larsen and I shared our accessibility testing experiences. This year we talked a lot about the subject. CAST 2015, KWSQA 2015, Agile TD 2015, to name a few. 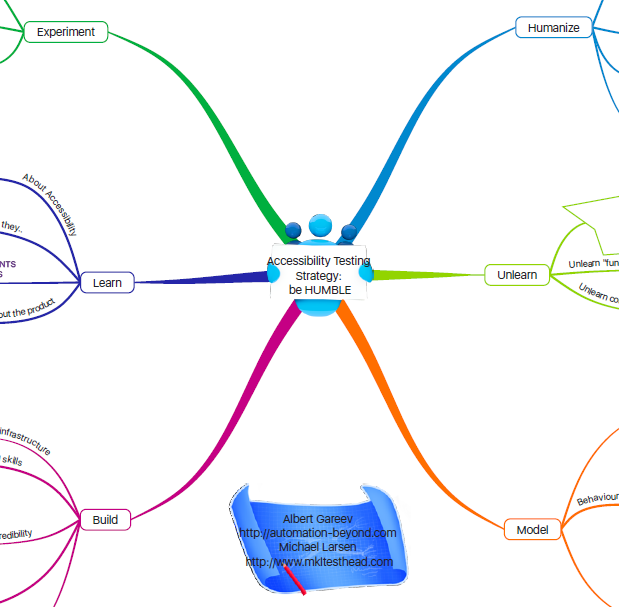 Click on the image to download full mindmap in PDF. Textual description below. H.U.M.B.L.E. – Agile Accessibility Testing Strategy. See it from the human side. Forget about functions and features. Product is a MEDIUM allowing PEOPLE to COMMUNICATE with each other through DISTANCE and TIME. Inspired by Cem Kaner: “Software Testing as a Social Science”. Test and pay attention to emotions! They are important indicators of potential problems. Inspired by Michael Bolton: “Emotions in Software Testing“. Unlearn from your typical habits. Devices and browsers you use, and the way you use them. Unlearn the way you observe, understand, and operate. Be able to switch between different habit models – when you Build them (see further). Model users’ objectives: purpose – scenario – task – operation. What kinds of problems with the product will impact the user – and how? What problems the users’ are likely to face? Build your testing infrastructure – configurations of hardware/software and tools. Develop your own testing heuristics! Coming soon: PASARAN – they shall pass! Black Box Testing Heuristics. Sneak peek. Learn from your experiments and models! What problems it helps to solve? Experiment and build expertise in the team. Closely collaborate with designers, share models, test their models, give feedback, share learning. Closely collaborate with programmers, share models, experiment with what they build, give feedback, share learning. Trackback fromAccessibility - “Why should I care?”- testing and designing products for people with disabilities.